When we talk about the greatest games of all time in terms of their design, technology, and art, are we fooling ourselves? In a recent opinion piece, Leigh Alexander suggests that "truly great games" are all about players' personal contexts. 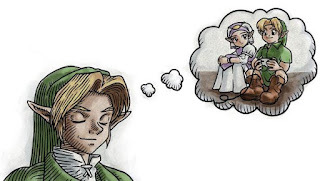 This week, we use her article about the mystique surrounding Ocarina of Time as a starting point for a discussion about how our memories and the passage of time shape and re-shape some of our favorite games. As always, we're looking forward to hearing your thoughts in the comments! - When you think about your favorite games, how crucial was the context in which you played themt? - Have you ever revisited a game and then come away with a drastically new opinion? - How should we take a game's context into account when thinking about its legacy? Hmm... I think the direct link is busted? Thanks Chynes. We'll work on it ASAP and let you know when it's fixed. Also when we remember something it isn't like pulling out a photo but more like rewriting an a story we had which means it is greatly influenced by how we feel at the time we remember/rewrite it so to quote AssCreed "Anything is true and everything is permitted and Jager bombs are lovely as it Cap Morgans and coke. This is perhaps getting off the main point somewhat, but looking back at memorable gaming experiences, I tend to find myself exclusively thinking of games played with another person present. Mostly multiplayer games, but playing a single player game like GTA or Monkey Island is still improved by the presence of friends or family. Even recently, I enjoy games more when they feel like a shared experience, through forums, blogs, or just talking to friends. Even watching someone else play a game, whether at home, a Let's Play or a live stream tends to increase my personal enjoyment of that game. I wouldn't necessarily rate a game as being better because I played it with someone, though, simply more memorable. I don't think the context-as-quality-modifier had much of an effect on me, though I see how it could. I have strong childhood memories and strong gaming memories, but I don't have the slightest idea how they line up. The exception to that, though, is multiplayer games. Mario Kart Double Dash may not be the greatest game ever made, but playing it with a full team of 8 (which required the obscure Gamecube network adapter) after a long day of work was some of the most fun I've ever had. Have you guys read Tom Bissell's book Extra Lives? Context plays a major part in his stories about gaming. The one about GTA 4 especially is astounding. Ah, Link remembers his SNES just as fondly as I do. No second controller for Zelda, though? Maybe they were playing Super Mario World and passing it back and forth. Good point regarding multiplayer games. The more people around you the more memories to be had, I suspect. I've read an excerpt about the GTA IV story and was similarly impressed! I have to get around to reading that entire book. On a related note, I feel like I have a soft spot for Persona 4, entirely because I watched Vinny and Jeff from Giant Bomb play through it. I'm with you Ben. My most memorable gaming moments, and extended moments in particular, involve my friends. The exceptions tend to be horror games, but even then you could say they create memorable moments in my sudden and desperate need to be around someone. As somebody, who never had a N64 back in the days and played Ocarina for the first time by the end of the Gamecube Era - It's NOT just nostalgia. The game is actually that good. When I first started working at a development company, people referenced Ocarina in many design meetings. Years later, when I actually played it everything clicked into place for me. That game did so many things right, it's amazing! And actually, the same thing happened to me with MGS. I played MGS2 around the time MGS3 came out. It blew my mind. By that time I was kinda used to the cinematic feel of modern games (which is still exceptionally executed in MGS2). But I especially remember the 4th wall sequences by the end. Metal Gear calling you over the coded and telling you to turn of the console and stuff like that. Even thematically it seemed so far ahead of it's time. Sure, any piece of work must always be understood in it's own cultural and historic context. But every artist always strives to create that special something which can perhaps transcend history. Something that is not only great in it's time but great forever. The stuff legends are made of. In this regard, I feel the other way around. I find it hard to separate advertisement hype from the actually quality of a game. I tink time does a good job in separating the wheat from the chaff. The games that are remembered fondly after years usually have some of that universal quality. After finishing Skyward Sword, I second your endorsement of Ocarina. Somehow, even Nintendo has seemed to overlook the lessons that game teaches. I also agree that going back and revisiting old games is crucial. It's just so hard: the industry moves so fast and great games come out every year. Strange as it sounds, I actually feel a little guilty playing old games when there are new franchises I haven't even touched.